Gochujang (go-choo-jang) is a thick, fermented chili paste from Korea that’s fast gaining popularity in the U.S. You can find it in ethnic markets and many supermarkets, as well as online. Gochugaru are Korean red pepper flakes. 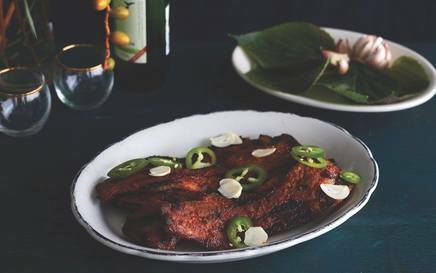 This recipe, from Everyday Korean by Kim Sunée and Seung Hee Lee, is like bacon jerky and a delicious way to get acquainted with these ingredients. Serve with lettuce leaves and steamed rice.